2. Can you show me our Rightmove Performance Report and your analysis?– (see blog post Your Rightmove Property Performance Report). Most agents these days can provide you with one, but can they analyse it? If they can’t – send it to me! [email protected] – I’ll tell you what you need to know. 4. What did our viewers buy?– this is a great one! Your agent should be keeping in touch with your viewers to discover what they eventually went on to buy. By doing this, you can build up a picture of the types of buyers looking at your house. For example, if they went on to buy a completely different style of property, it could be that your marketing is appealing to the wrong target market. If they bought somewhere very similar, you need to compete better. Even the best agents need nudging to find out this information, so nudge! 7. Why hasn’t our house sold – other than the price?– I have often asked agents this question, and listened to them trying to come up with an answer. 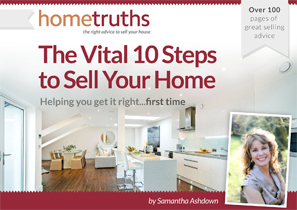 The truth is, there are often several reasons, and it’s highly likely that none of those reasons will be the asking price! Ask your agent for constructive ways you can help him to attract viewers, and make sure he knows he can be honest. If he can’t come up with anything, call me, and I’ll tell you!